The Metropolitan Electricity Authority (MEA) conducted an exhibition of how to make use of abandoned power poles from the underground cable project for the prevention of coastal erosion along Bang Khun Thian coastline. The exhibition, Thailand Social Expo 2018, was the collaboration between public and private sectors held at IMPACT Arena Muang Thong Thani from August 3-5, 2018. 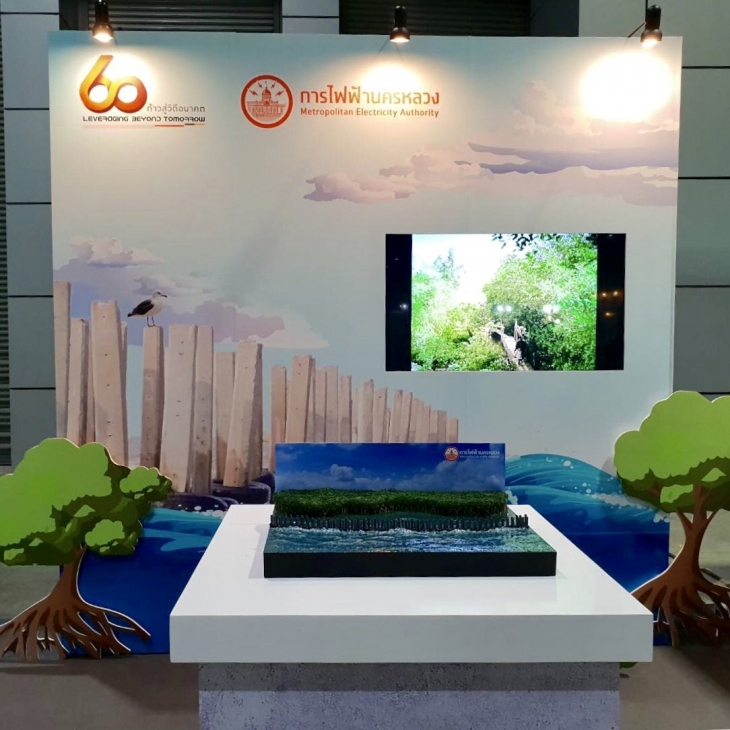 On exhibition was the Smart Metro project to demonstrate the handover of the uprooted power poles to support the Bangkok Reforestation under the King’s Philosophy for the coastal protection and restoration in Bang Khun Thian district. MEA's power poles were strong and durable typically 30-year life or 30 times longer than that of wooden poles. The pole walls can reduce the force of the waves which result in greater amounts of sediment, young plants and seedlings behind the breakwaters for the restoration of nature and the return of many species of birds and sea animals to help boost the well-being of society for sustainability. This project has given MEA the only state-owned public utility in Thailand a winner of the Asia Responsible Enterprise Awards 2018 in Green Leadership. The Thailand Social Expo 2018 was an event to showcase the government's social achievements. It was the first social expo in Thailand by integrating collaboration from associates i.e. public sector, private sector and civil society to demonstrate the government’s social studies, social innovations and technologies as well as social important activities in Thailand and ASEAN. Its aims were to minimize social inequality and to create equal opportunities for all Thais especially for young people, women, families, the elderly, the disabled and the underprivileged. MEA welcomed those interested in attending the event at Hall 5-8, IMPACT Arena Muang Thong Thani during August 3-5, 2018.